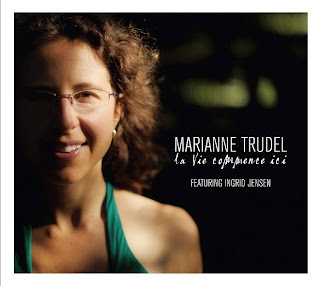 This record opens with a short duet between pianist Marianne Trudel and trumpeter Ingrid Jensen, a slow mournful number called Question which feels like it is exploring the space between piano and trumpet, before moving on to a lively upbeat number, Deux soleils, which may or may not be the answer. This quintet certainly have a lot of answers. The CD cover proclaims "featuring Ingrid Jensen", and whilst she does feature strongly, I think that does a slight disservice to herself and the other players, particularly Jonathan Stewart on saxes. Rather than featured soloist, Jensen is an integral part of the quintet. She and Stewart weave in and out of each other's lines, producing intricate patterns, sometimes soaring like birds, sometimes growling like caged animals. Trudel wrote all the tunes, many of which carry an emotional intensity. The writing reminds me of Maria Schneider's work, albeit on a different, more intimate scale. Jensen has played on several of Schneider's recordings, including the award-winning Sky Blue, which was the sound that I was reminded of. But for all its north American pedigree, there is also a European sensibility to the music, a mood of the celtic fringes. Trudel's solo on Soon builds and builds with a hint of melancholy before releasing us back into the uplifting theme. This track also contains fine solos from bass player Morgan Moore and Jensen. The trumpeter has a warm tone that can envelop one. Jensen and Trudel have another tune to themselves on the evocative and haunting Night Heron.